If there is one thing that most people don't know about me, it's that I was adopted (you can read the full story here, if you'd like.) Unfortunately, my Mom was never able to have kids herself but they knew they wanted to have a baby and expand their family so that's when they turned to adopting. And I couldn't be more thankful that they did! I love reading my Mom's letters back from when they first found out that they got selected and would be welcoming me into their family...I can only imagine the happiness and excitement that they felt. Supporting those who choose to adopt, or who have been adopted themselves, has always been so important to me. Parents who adopt not only have some of the biggest hearts, but they open their home to children who come to them from all over the world and I think that's pretty darn incredible. Living in Columbus, I've always been a big fan of Wendy's (apple pecan chicken salad on repeat) and of the founder Dave Thomas, who was actually an adopted child himself! It was only until recently did I learn of the foundation he started in 1992 called the Dave Thomas Foundation for Adoption. This foundation works to find permanent, loving homes for more than 130,000 children waiting in North America's foster care system. The Dave Thomas Foundation for Adoption worked with Wendy’s to establish the Wendy’s Wonderful Kids Program to focus on children who have been waiting the longest in the foster care system. How wonderful is that? It's truly amazing what they are doing. Dave Thomas believed that children in foster care “aren’t someone else’s responsibility, they are our responsibility.” Wendy’s continues to support that belief through fundraising and collaboration with the Dave Thomas Foundation for Adoption. Through November, Wendy's is doing something really special to highlight the power of foster care adoption through a child's eyes. 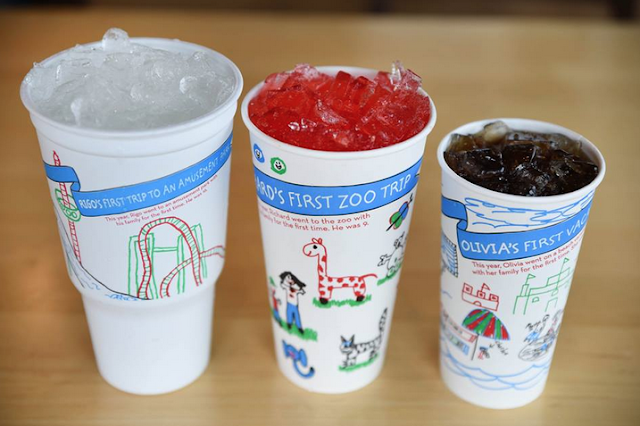 They are showcasing the artwork of four children who have been adopted through the Wendy's Wonderful Kids Program on cold beverage and specialty drink cups. The illustrations that the children do are of special "Family First" moments, such as a day spent at the park and so forth. So, next time you order your beloved diet coke make sure to take a look on the outside of your cup for one of these stories! The family first videos can be viewed here (on Wendy’s adoption page) and will certainly melt your heart! I know that, for me, they also serve as a great reminder to not take the little moments with your family for granted. Does you or someone you know have a special adoption story? I would love to hear it! And be on the lookout for these family stories on your Wendy's cups! I love to hear adoption stories. My husband and I hope to adopt through foster care one day soon. Currently though I am pregnant with baby #3 (most likely our last pregnancy so in 2-3 years foster-adoption is our plan). I love to see organizations especially well known ones (like Wendy's) provide to such great causes! I just read your adoption story, and seriously have tears in my eyes! What a beautiful story!!! And I love what the Dave Thomas Foundation for Adoption is doing! I will be sure to pass this on, especially to my cousins who were adopted as well!!! I am heading over to read your adoption story but I have to say I love seeing adoption storys. My Husband's Mother, whom passed away when my husband was 12, gave 1 of her 6 babies up for adoption. Yes i know, 1 of 6 sounds a bit strange but this is because she had to give custody to all the fathers or a family member, court ordered, and my sister-in-law was the only one whose father couldn't take her. (My story already sounds complicated, I know.) Anyways, adoption holds very dear to my husbands heart and now that we are wanting to start a family but due to health reasons I am not about to carry myself, we are looking into adoption (and surrogacy). But I have always loved the idea of being an adoptive mom, I've wanted to for as far back as I can remember. All Babies (babies meaning children, not just actual babies) need someone to love them. Yes! they do. Every adoption story is so unique and special. I'm so sorry to hear this about your health and hope that your prayers are answered one day soon. Thank you for sharing Ashlee! Absolutely love this story...I'm sure your daughter is so thankful to have such amazing parents. Thank you for sharing Kassy! I've read your blog for a long time and I don't know how I forgot that you are adopted! My husband and I have tried to have a family of our own for 6 years when our adoption story started. We didn't go through an agency but through some mutual friends. It really sort of fell in our laps and I'm so sad this isn't how it works in most cases. We adopted our sweet daughter, Ainsley, in June. We met with the birth mother in late March and hit it off! I was so nervous and didn't think our first meeting went well but she loved us! We've become friends and I'm so grateful she chose adoption. Without her, we wouldn't have been able to have a family of our own! This is such an amazing story, I'm so happy for you and your family Kari!! Everyone deserves to become a parent, if they desire to. I hate that it is so hard for some families. And you're right-it wouldn't have happened without the birth mother making a selfless decision. I had no idea you were adopted and just read your adoption story! It is incredible! Bill and I always talked about if we were unable to have kids that we would 100% adopt. Good for Wendy's for getting involved!